The Pentek CRFC20-BB bed of granular activated carbon (GAC) between the outer shell and the core is specifically designed to significantly reduce chloramine taste and odor. 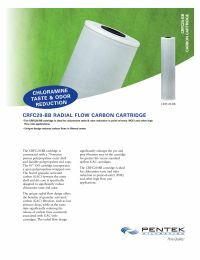 The unique radial flow design of the Pentek CRFC-20BB filter offers the benefits of granular activated carbon (GAC) filtration, such as low pressure drop, while at the same time significantly reducing the release of carbon fines commonly associated with GAC style cartridges. The radial flow design significantly enlarges the pre and post filtration area of the cartridge for greater life versus standard upflow GAC cartridges. NOTE: This filter is the same as the Everpure EV910847 and Everpure DEV9108-47.